Although this web site may provide general information concerning potential legal issues, it is not a substitute for legal advice from an attorney who knows the facts of your particular situation. You should not and are not authorized to rely on this web site as a source of legal advice. Your use of this site does not create any attorney-client relationship between you and The Law Office of Richard Vaznaugh. Information provided on this web site is provided “as is” without warranty of any kind, either express or implied, including without limitation warranties of merchantability, fitness for a particular purpose, or non-infringement. The Law Office of Richard Vaznaugh periodically adds, changes, improves, or updates the information and documents on this web site without notice. The Law Office of Richard Vaznaugh assumes no liability or responsibility for any errors or omissions in the content of this web site. Your use of this web site is at your own risk. Under no circumstances and under no legal theory shall The Law Office of Richard Vaznaugh or any other party involved in creating, producing, or delivering this web site’s contents be liable to you or any other person for any indirect, special, incidental, or consequential damages of any character arising from your access to, or use of, this web site. We will evaluate your request and advise you as soon as possible. The Law Office of Richard Vaznaugh reserves the right to refuse permission to copy, distribute, broadcast, or publish any of its copyrighted material, including text and images on our web site. If you use any links in this web site to web sites not maintained by The Law Office of Richard Vaznaugh, you will leave The Law Office of Richard Vaznaugh web site. The linked sites are not under the control of The Law Office of Richard Vaznaugh, and The Law Office of Richard Vaznaugh is not responsible for the contents of any linked site or any link contained in a linked site. 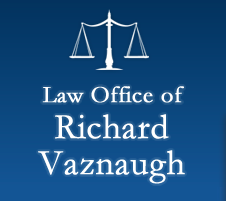 The Law Office of Richard Vaznaugh provides these links to you only as a convenience and the inclusion of any link does not imply recommendation, approval or endorsement by The Law Office of Richard Vaznaugh of the site.